OPP #11: Franki Elliot | Put Words Together. Make Meaning. 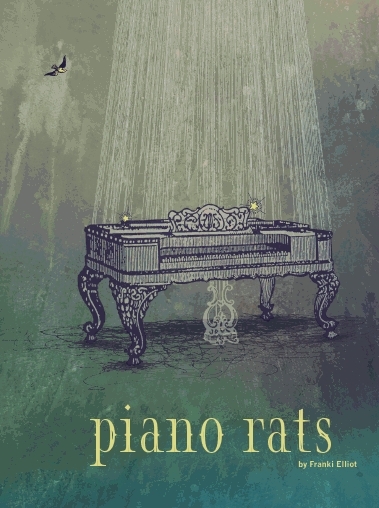 anything sadder than rats living in a piano. smoke cigars, but now he can barely open a letter. had one page of the bible that they hid in their chests. piano) and suddenly, you’ve got 75 million people dead. is going to work out. It is because it has to. I’m a sucker for poems that make leaps I can follow, and a double sucker for poems that can do this with attention to detail. The leap from the call about cancer to the line “something so small (something hidden in a rotting/piano)” is heartbreaking. The poem, filled with the quirks and conspiracies of people who populate the speaker’s life, ends with an unexpected affirmation. Despite all of the differences, the sadnesses, the failures, and the conflicts, there is the morning shower. There is the faith that everything will work out. And isn’t that all most of us have? 1. Choose a small living thing and place it inside a musical instrument. See where it goes. 2. Choose two professions, a family member, and a person of indeterminate relationship (as in the linguist, the violinist, the grandfather, and the woman) and try to link things they told you. This entry was posted in Inspirations, OPP, Poems (Others) and tagged curbside Splendor, franki elliot, piano rats, poetry by Donna Vorreyer. Bookmark the permalink.